Yesterday at Target, I heard the unmistakable cry of a newborn. You know the one--tiny, insistent, and louder to the mother than to anyone else in the surrounding area. I saw the mom pushing a cart back and forth to calm the baby, who was in an infant carrier in the cart. I was instantly transported back in time to stressful trips to the store with a newborn in tow. You never know when they’ll be hungry, despite the fact that you’ve just fed them, bodily fluids are likely to explode out of somewhere and make a mess on you and/or the baby, and it’s not always clear why they are fussing, but going to Target usually seems to set them off. Maybe it’s all the red? Who knows. Later, in the parking lot, I saw another mom at the cart return. She was baby wearing while trying to lift a toddler into a shopping cart, but the logistics were not working out. I saw her smiling, laughing at the impossibility of the situation, and I thought of times when I have laughed to keep myself from crying. Moms are amazing, and we often have no one telling us what a great job we’re doing. We give ourselves away and then piece ourselves back together again. I would love to elevate the untold stories of regular, every-day moms. This is where you come in! Are you a mom and a business owner? Are you a cancer survivor or do you suffer from mental illness? Do you foster? Do you homeschool your children? Are you a teacher, doctor, therapist, pastor, or real estate agent? Are you pursuing a college or post-graduate degree? Do you care for a medically fragile or terminally ill child? Do you parent a child with disabilities? Are you pursuing a dream? Have you published a book or started a nonprofit? Do you work outside the home? Do you volunteer for an organization you're passionate about? Anything goes! Blog: Comment on this post with the name and e-mail address of the person you are nominating (it can be yourself) and finish the sentence: “[person’s name] is a mom and …” For example: “Lindsay O'Connor is a mom and is in the process of writing a book.” I will send an e-mail to see if the person you nominated is interested in being interviewed. Instagram: Find the #momand post on my Instagram account @shamelessbibliophile Tag the person you are nominating and finish the sentence: “[person’s name] is a mom and …” For example: “@shamelessbibliophile is a mom and is in the process of writing a book.” OR send me a direct message on Instagram. I’ll send a message to whomever you tag to see if she is interested in being interviewed. 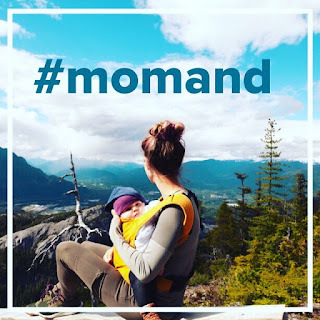 Facebook: Find the #momand post on my Facebook page, Rooted in Love. Comment on the post and tag the person you are nominating. Finish the sentence: “[person’s name] is a mom and …” For example: “@rootedinlove is a mom and is in the process of writing a book.” OR send a direct message through my Facebook page. Thanks for your help! I can’t wait to share your stories!